Are you thinking about quitting your job, but not sure you're doing it for the right reason? Or are you worried that you should stay with your current employer for the time being? Before you quit a job, you should be very sure that you want to resign. Once you've turned in your resignation, you probably won't be able to change your mind and get your job back. Hating your job might not be a good enough reason to quit unless you have another job lined up. There might also be other reasons you should keep your job or wait for a better time to tender your resignation. You might even be able to turn things around and learn to love the place where you work. That said, there are circumstances beyond your control where quitting may be your only viable option. Here are the top 10 warning signs that you need a new job. 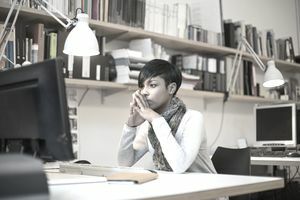 Sometimes, even if the work environment is difficult, it can be strategic to give another reason for quitting other than that you hate working at the company. Being polite about quitting can help you move on without burning any bridges. 1. You Found a New Job. Obviously, the best reason for quitting a job is that you've found a new one. Before you quit your job, though, make sure that you've covered all the bases, including having a confirmed job offer and a cleaned-out computer and office before you quit. 2. You Hate Your Job. Don't quit your job right away, even if you hate it. It's better to strategically plan your departure so that you're leaving on your terms and not scrambling to find another position. Here's what to do if you hate your job. 3. Illness. Personal or family illnesses are both legitimate reasons to quit a job, and sometimes a sudden illness can be an excuse to leave a position. If it's a legitimate reason to quit (i.e., you or someone in your family is chronically ill), make sure that you have continued health insurance coverage after you leave. Also be aware that you may be eligible for Family and Medical Leave due to personal or family illness. 4. Difficult Work Environment. Co-workers, bosses, and a negative office environment can all make your job difficult. In fact, they can make your workplace somewhere you simply don't want to be. Once you have tried every option, you may need to make a decision to leave. Here's how to decide when to leave a difficult workplace and how to move on. 5. Schedules and Hours. When you lose childcare or your work schedule has changed and it's difficult for you to adjust, you may need to quit your job and look for one that is more accommodating to your personal schedule. Leaving a job because of scheduling issues is a legitimate reason for quitting a job. 6. Going Back to School. Going back to school, either on a part-time or full-time basis, can necessitate a job change. Given your school schedule and the demands of your job, your current employment may no longer be a good fit. 7. Career Change. I know more than a few people who have quit a professional job because they wanted to do something different or didn’t want to deal with stress or travel of their industry any longer. Whether you want to move up or down the career ladder, a decision to change careers can make good sense if you're looking to do something different. or working remotely is an option. You can always ask your boss if telecommuting is an option. 9. You Got a Permanent Position. If you're working as a temp or at a part-time job and want to move on, one of the best reasons to give for quitting is that you have found a permanent full-time position. 10. What Your Gut Tells You. One of the best mentors I ever had told me that the best way to make decisions is to listen to your gut. He said it worked with hiring, with deciding to accept a job, or deciding to quit a job. He was right. If your gut is telling you to quit, listen to it. Here's how to resign with class. The survey notes that 72% of employees were satisfied with their current role, 69% were optimistic about finding a new position, and 80% said even one bad day at work would make them likely or very likely to start a job search. Once you've made the decision to resign, it's important to do it as smoothly and gracefully as possible. Not sure what to say when you give a reason for quitting your job? Here are sample resignation letters that cover just about every scenario for quitting mentioned above, and here's what to say in person when you quit your job. Also, review what not to say when you quit a job. How much notice should you give? In most cases, it's standard to give two weeks’ notice. However, in some cases, you may be unwilling or unable to provide notice. That's especially true if you are in a difficult or dangerous work situation. Here are reasons for quitting without notice. You may not be eligible for unemployment compensation. If you quit your job without good cause, you may not be eligible for unemployment benefits. Here's information on eligibility for unemployment when you quit. You'll need to be prepared to answer interview questions about why you quit your job. Here are sample answers you can edit to fit your own circumstances.